Portland was amazing this morning. Yes it was brisk, but it was sunny and the farmers’ market was full of gorgeous spring flowers. I couldn’t get enough of these beautiful “double daffodils”, the likes of which I had never seen. The white ones are Sir Winston Churcills and the yellow are Tahitis. 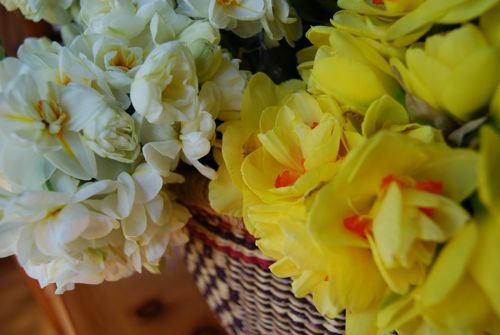 I am having a baby shower for my sister tomorrow morning, and the daffodils look so pretty on my table, and have the most delicate narcissus scent. Perfect for celebrating my sister and the forthcoming arrival of her sweet baby. Next Post The winner of the Velvet & Sweet Pea Giveaway! If you have a garden and are looking to plant some like this, I highly recommend Brent&Beckys bulbs (not affiliated – I wish!) They have an absolutely amazing selection, and very good prices. Another good place, slightly more $$, is John Scheepers. 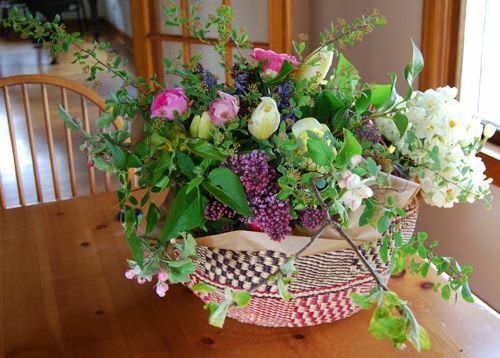 Hope the shower goes well; the arrangements, at least, are beautiful! Thanks for the info Tommasina! I will keep those in mind for bulb planting season, they are so beautiful and I love the vintage look of them. Ooooh. Maybe I will go tomorrow. 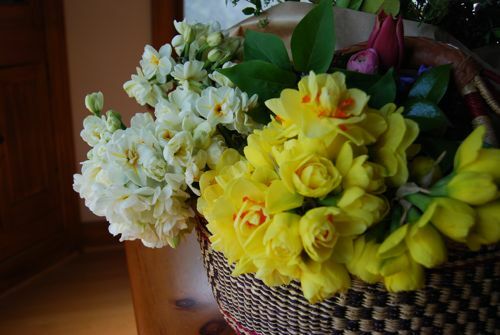 I adore fragrant daffodils! If you ever need suggestions for planting I have some favorites, including some that were bred in Oregon, that are amazingly fragrant. They are so easy to grow too, it almost seems like cheating. I hope you have a lovely party, your lucky guests will have something delicious to smell! Sounds perfect! I might take some notes next time we meet up!